Why is it Called Skype? Skype (owned by Microsoft) is a freemium communication service that was created by Janus Friis and Niklas Zennström in 2003. The company was initially headquartered in Luxembourg, but was later purchased by eBay in 2005 for $2.5 billion. A few years later in 2011, Microsoft purchased Skype Technologies from Ebay for $8.5 Billion in cash (their largest acquisition to date). Skype makes communication easy, fun and enjoyable. Users can use their built in microphone and camera to chat over the internet (VoIP) rather than racking up all those long distance minutes or roaming charges. You can also transfer files, share screens and video conference (similar to Google Hangouts). Skype calls from peer to peer on a computer are free. However, Skype charges users a low fee to make outgoing calls to landline and mobile devices. You can either buy credits (pay as you go) or purchase a subscription fee to make calls or send texts all around the world. The app is available on Android, iOS and Blackberry 10 operating system. Why is Skype called Skype? Unlike most other VoIP services, Skype is a hybrid peer-to-peer and client–server system. Friis and Zennström wanted their name to reflect this. Initially, they called it “Sky Peer-to-Peer,” since the connection utilized peer-to-peer technology that worked without wires. However it’s not exactly the easiest name to remember or spell and it’s definitely not fun, one of the characteristics of their product. They needed something catchy, but relevant to their product. They eliminated “e-to-peer,” which shortened it to Skyper, but skyper.com was already registered so they removed the “r” and called it Skype. Also, notice the cloud (sky reference) engulfing the Skype logo. 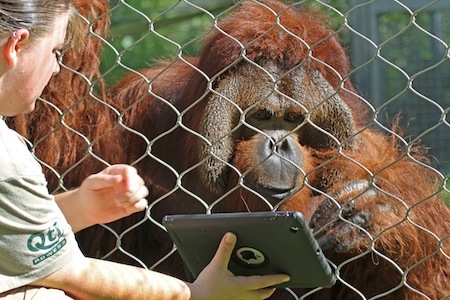 Two orangutans, Mei and Mukah, of Cameron Park Zoo in Waco, Texas, have started using Skype and other technology as part of an enrichment program, participating in video calls with other orangutans at distant zoos.